In season year round. Bright blueberry flavor any time of the year. USDA organic. Certified organic. Freshly frozen. Unsweetened. 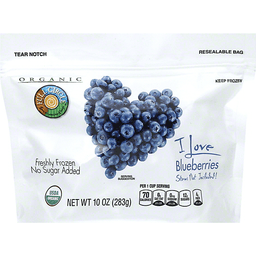 Per 1 Cup Serving: 70 calories; 0 g sat fat (0% DV); 0 mg sodium (0% DV); 12 g sugars; 4 g fiber (16% DV). www.fullcirclefoods.com. Certified organic by CCOF. Quality guaranteed. If for any reason you're not satisfied, we'll give you a full refund. Our Story: We believe in purity over preservatives, the simple goodness of nature and delivering that qualityto your neighborhood grocer. With Full Circle Market, better choices and affordable prices are always in season year round. 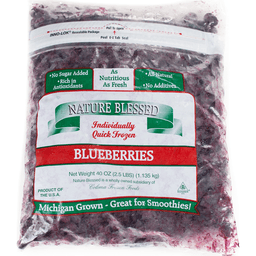 Our Blueberries: These organic blueberries are picked ripe and freshly frozen. Use them in your smoothies, baked goods and breakfasts. A good source of fiber. Come visit us! FullCircleFoods.com is your destination for unique recipes, interesting articles, product overviews and more. Product of USA. Product of: Chile.